He covers several aspects of historical importance in the Basque Country, including the age-old custom of smuggling back and forth across border between France and Spain. The documentary also includes images of the nets used to catch migrating birds that are put up on ridges of the Basque Pyrenees close to the village of Etxalar in Navarra – an ancient tradition which survives today, and Welles also interviews some mountain shepherds, including a very entertaining chat in English with a Basque shepherd about the years he spent in Colorado. Traditionally, many shepherds emigrated to parts of the USA, Argentina and elsewhere in the Americas – some settled there along with their descendants and others returned to mainly rural parts of the Basque Country where they built their homes with money earned overseas. 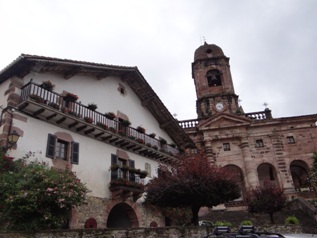 In many villages in the Baztan-Bidasoa region of Navarra and elsewhere, elegant buildings that at times almost resemble palaces can be seen, built by returning Basques who made their fortune abroad and returned to the homeland. 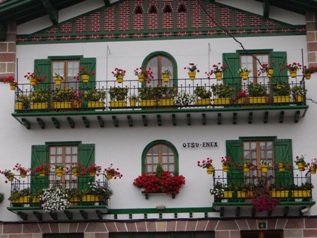 They are known in the Basque Country as Indianos. Welles also talks to an expat American journalist about differences in schooling between the USA and the French Basque Country, and throughout the film Welles engages in some lively banter with those he meets and talks to. At one point he gets quite philosophical about comparative lifestyles and the difficulty in striking a balance between progress via technology and the need to preserve family structure and traditions. 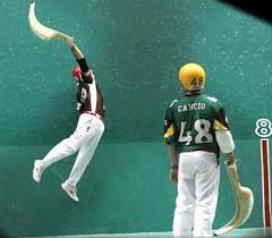 The second part of the documentary focuses on that most emblematic of Basque sports, pelota, pointing out that it’s played by everyone from small kids to fishermen and priests, with some suitably fine images of locals playing both hand pelota and cesta-punta, the latter played with a type of basket that it is said was once used for carrying fish or fruit.